Fatih Birol thinks energy investing stinks. Never heard of him? A Turkish economist and Executive Director of the International Energy Agency, he’s the Bill Gross of Energy. And, like Bill Gross was in 2011 when he predicted interest rates were going to surge and completely exited the Treasury market in a move that cost investors hundreds of millions, he’s just as wrong. To hear Birol tell it, energy investments are going to be a disaster. Speaking in Paris this past July, he observed that there may be as much as $1 trillion of energy investments and $280 billion in natural gas investments that are “uneconomic” if governments around the world successfully limit global warming to 2C. Evidently he’s never heard about the Unstoppable Trend we call Scarcity & Allocation. Today we’re going to talk about what Birol – like a lot of investors at the moment – is missing and what it means for your money. Then, I’m going to give you my take on one of the best energy companies you can buy… at any price. With more than $1 trillion on the line and up for grabs, it’s potentially very profitable information you won’t want to miss. Here’s what you need to know before everybody else wakes up. Oil recently fell by 40% from a peak of $63 per barrel to only $38 per barrel before finding some footing in recent trading at around $46. Understandably, many investors are in shock. Not only is oil a major worldwide commodity, but the oil industry has been the go-to sector for yield-starved investors attracted by both its upside and its income potential. That oil’s suddenly an investment no-no according to an industry insider like Birol is simply appalling to most investors. So they’re trying to make a decision that they’ve never had to make before when it comes to energy… buy low or get out of the way… even as they brace for more bad news. Call me crazy, but I can’t think of a better time to invest even if prices go lower from here. Like Warren Buffett, Carl Icahn, and Sir John Templeton – all great contrarian and value-oriented investors – I know that lower prices signal greater bargains. I agree. Abandoning energy investments is simply not a good idea. Money is still cheap, which means that mergers & acquisitions are inexpensive. We live in an era of “peak everything,” meaning that we’ve reached the limits of what our planet can produce to serve the 7.1 billion people on it. Water, medicine, insurance, health care, and yes… oil. That means what oil we do have will become more expensive over time. There’s nothing fancy here, just simple economics at work. This is what Birol and millions of investors who have left energy investments for dead are missing. Simply put, if there’s only one person who wants to buy the last egg at your local grocer, the price of that egg is going to be low. But if there are 1,000 people who want it, the price of that same egg will be astronomical. Energy executives understand this better than anybody on the planet. They have to. 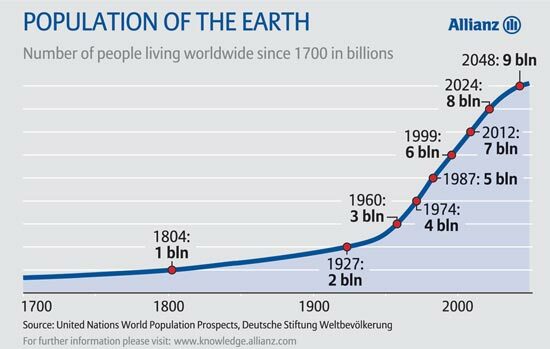 According to various studies, there will be eight billion people by 2024 and nine billion by 2048. That’s a growth rate of 12.6% within the next nine years and another 12.5% in the next 24 years after that. Every single person on the planet today needs energy. And, they will still need it tomorrow because it quite literally powers growth. More to the point though, I haven’t heard a single energy executive yet express fear that they won’t be able to sell every single drop of oil they bring out of the ground. That’s something politicians and environmentalists bicker about and it’s worth pointing out that neither of them are motivated by profit. The current meme is that world energy demand will go to hell in a handbasket if the Red Dragon goes on a diet. That seems to be happening as China comes unglued so millions of investors have sold and sold hard. Exxon’s dropped 25% from its peak. BP has shed 40%. Smaller debt-laden companies have gone completely under. I know it seems like the industry is dying, but the logic is flawed. 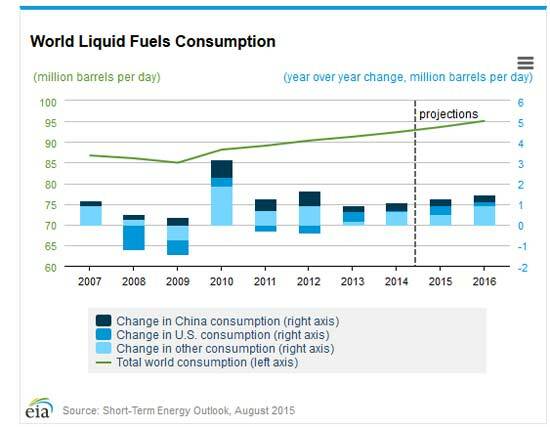 According to the IEA, Birol’s own team, world consumption is projected to steadily rise even if you factor in a slump in Chinese demand. All told, world consumption is set to rise from 91.28 million barrels per day in 2013 to 95.08 million barrels per day in 2016, a 4.16% increase. That’s outpacing both production AND conservation. I know that doesn’t sound like much in an era where trillion-dollar figures are bandied about, but this is actually one of the conservative forecasts out there. OPEC, for example, issued a report in July that forecast global demand growth will top 1.34 million barrels in 2016 alone. Meanwhile, India, is on track to hit a landmark in its oil consumption this summer even as it became the world’s 3rd largest oil consumer. According to Forbes, India’s demand for oil grew by an additional 300,000 barrels per day this year, outpacing even China’s surge in demand a decade ago. It’s no wonder because India’s real GDP has been growing by 5-10% per year lately, up $110 billion in 2014 alone, so more demand equals more oil sold. And finally, according to PricewaterhouseCoopers, merger and acquisition (M&A) activity in the energy sector totaled $34.5 billion in the first half of 2015. As impressive as that is, the number doesn’t tell the entire story because it only includes deals valued at $50 million or more. Factor in the smaller transactions under that threshold and I think you’re talking about $40-$45 billion. Perhaps more. At the same time, the pace of acquisitions is accelerating and the price of each deal is going up. For example, there were 47 deals valued at more than $50 million each last quarter compared to only 39 in Q1 2014. If the industry were dying as people believe, these deals would be conducted at fire-sale prices that resemble your neighborhood garage sale. Instead, every transaction seems to boost stock value which is, of course, great for investors. Last April, for example, Shell announced a $70 billion buyout of BG Group, which saw its shares spike 38% as a result of the news. Make no mistake about it… the strongest always survive, especially when an industry is going through a massive short term re-alignment like energy is today. I believe the industry has reached a watershed moment and that huge numbers of investors will suddenly wake up to the reality that they’ve totally misjudged the number of “eggs” on the shelf and rush to the store. It may be tomorrow or a year from now, so there’s an element of patience involved. Investors with the foresight to go along for the ride almost always get to see their shares balloon in value, often at healthy double-digit premiums. The best way to play this is to buy one or more of the “major” oil companies to serve as your energy anchor. Then fill in around the edges with smaller pipelines, MLPs, and even service companies. The company has a return on equity of 7.79% and a net profit of 6.95% produced by global operations. But what I really like is the appealing 5.48% dividend yield versus only 2.2% for the average S&P 500 stock at the moment. I know earnings are projected to decline 62.66% in 2015 and I’m aware that analysts have hit the company with 11 negative revisions in the past 60 days. Right now prices reflect a 5.48% yield. At $55 a share that jumps to more than 7%, so buying as prices drop makes perfect sense. Combine that with an eventual turnaround in prices as demand consolidates and you could very easily see double-digit returns on top of the cold hard cash you’ll pick up along the way. So bring on the lower oil prices “everybody” knows are ahead. As you have written recently, hedging with inverse ETFs, such as ProShares is a strategy we should be aware of. I assume this would hold true for the energy sector bears screaming about a recovery that’s not in the cards. When selling an ETF, it’s a market order, not a fund redeeming shares. So if I’ve correctly entered the ETF and want to exit profitably, why would anyone want to buy? In other words, the S&P, DOW, or energy sector crash, extreme pessimism and sell-offs pervade, and therefore the inverse ETF value substantially increases. If it’s a market order, it may not be filled at the current share price. So what control do I have, unless I can specify what price to fill. or not. RJ I am not that experienced in trading but I would try to use a limit order to sell that ETF. Also use of a trailing stop to protect your profit and downside, could be a way to get out if needed. I myself am considering use of inverse ETF’s if I can justify their value, and be able to get in and out as needed. Thank you. As Kieth has stated, we should use limit orders and trailing stops. After the hammering ETFs took in late August, if none of them were met, it most likely would be a wash, and I’d be holding the fund at or near my entry point. I like the concept of investing for an eventual turn-around but have difficulty judging how secure the dividend is considering the fact that drillers have been cutting their dividends. Can you provide any insight on Chevron’s dividend, or that of any other oil company that you have researched? I’ll be looking at some oil and gas companies right now! minimum I can buy? I’m a truck driver and would like to try and invest in something i use alot of. Keith Any thoughts on middle market MLP’s? I find it hard to reconcile this positive outlook for the petroleum industry with your colleagues advocacy in the new technology for sunpower. Care to comment? I just reread this article today. I’ve got a lowball order in for chevron, Exxon, and Hess. What do you think about these investments in light of today’s news of possible dividend cuts for all thee major oil companies?? Thanks buddy, just trying to be a smart investor and get in at a good time.